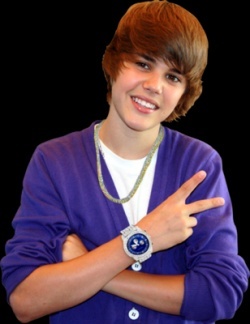 Justin Drew Bieber (born March 1, 1994) is a Canadian pop musician, actor, and singer-songwriter. Bieber was discovered in 2008 by American talent manager Scooter Braun, who came across Bieber's videos on YouTube and later became his manager. His debut extended play, the seven-track My World , was released in November 2009, and was certified platinum in the United States. With a global fan base, termed as "Beliebers", and over 38 million followers on Twitter, he was named by Forbes magazine in 2012 as the third-most powerful celebrity in the world. He had earned an estimated US$55 million in the previous 12 months. As of May 2012, Bieber has sold 15 million albums.